Amongst the giants of Chazanut in Eastern Europe, was the famous Chazan and Composer, Avraham Moshe Bernstein. His name is not well known today, even amongst lovers of Chazanut, as he did not make any recordings. He was, however, a key figure in the development of modern Cantorial music, a man who served his community, the Taharat Hakodesh Shul in Vilna, faithfully and conscientiously for 30 years. His music was praised by famous composer Rimsky-Korsakov as "among the elect of synagogal compositions". Not only was Bernstein a fine Chazan, he was also a first-class musician, who wrote beautiful compositions, and an erudite Hebrew scholar. He was fluent in several languages, and was known to be a very kind and humble man, and a genial personality. Avraham Moshe Bernstein was born on Tisha B'Av in 1866 in Shatzk, a small town in West White Russia - Minsker Gubernia, as it was in those days. He was brought up in a strictly orthodox household, and at nine years of age, was already well versed in Gemara. His father was a Baal T'fillah, and Avraham Moshe derived much pleasure in helping his father at the Amud. At the age of ten, he decided to leave his home town, and went to Minsk, where he entered the Yeshivah. The Chazan of Minsk at that time was the famous Yisrael Minsker, who was a very sweet 'davener', and possessed a very clear diction. Avraham Moshe was deeply inspired with his davening and decided to approach him for an audition, which was granted, and the young lad was accepted as a chorister in Yisrael Minsker's choir. However, he did not 'fit in' with the other choristers, whose ways were far from refined, and decided to leave. He left Minsk, and entered the Yeshivah of Mir, where he remained for two years. He was yearning to daven and sing, and after leaving Mir, he travelled from town to town until he arrived in Kovno. There, he met the renowned Chazan Raphael Judah Rabinowitch, of the Kovner "Chor-Shul", who combined the qualities of Chazanut, music, scholarship, and Hebrew culture. Bernstein became a pupil of Rabinowitch's, and a close friend of his family. It was Rabinowitch who was his guide and mentor in his future career. 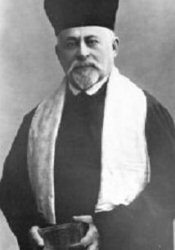 In 1888 at the age of twenty-two, Bernstein became Chazan in Bialystock's "Adat Yeshurun", where he remained for eighteen months, then becoming Choirmaster of the Great Synagogue of Riga, Latvia, where the illustrious Chazan Baruch Leib Rosovsky (1841-1919) (a pupil of Weintraub) officiated. In 1893 as already mentioned, Bernstein accepted the position as Chazan of the "Chor-Shul" in Vilna, known as the "Taharat Hakodesh", where he remained for thirty years. Bernstein davened in a most delightful and classical manner. He had a first- class choir, and their fine repertoire consisted of the finest classical compositions. The late Moshe Kusevitzky was a chorister there for a number of years, under the leadership of Chanan Glaser (who perished in the Vilna Ghetto). Bernstein composed quite a number of compositions, published in three volumes, named "Avodat Haboreh". 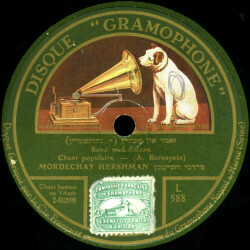 He also edited the "Musikalisher Pinkus" - a collection of Zemirot and Chassidic melodies, and a number of Hebrew and Yiddish 'lieder', among them the famous "Zamd un Shtern", words by Frug, and "Hemerel, Hemerl, Klap", words by Raizen. Among his compositions is the well-known "Yismechu v'malchuscho" for Cantor and Choir, which was included in the repertoire of the famous synagogues in Europe, prior to the last war. Unfortunately, the Synagogue that he had served so faithfully for so many years, treated him very badly and terminated his contract at the age of about 57. In order to survive, he became a teacher in a Jewish High School. He was completely unaccustomed to teaching and the effort undoubtedly shortened his life. He died on the tenth of Sivan in 1932, at the age of 66.